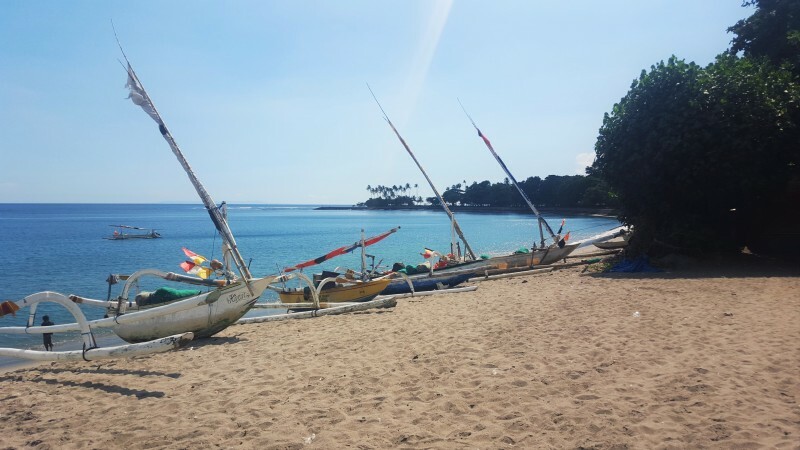 Sam and I have been dying to visit Lombok — the most westerly island in the Nusa Tenggara island group of Indonesia — since before we came to live in Indonesia. We never had the chance, though, until this Easter weekend in late March. Otherwise known as Bali’s “sister island,” Lombok has really taken off in the past five years tourism-wise. 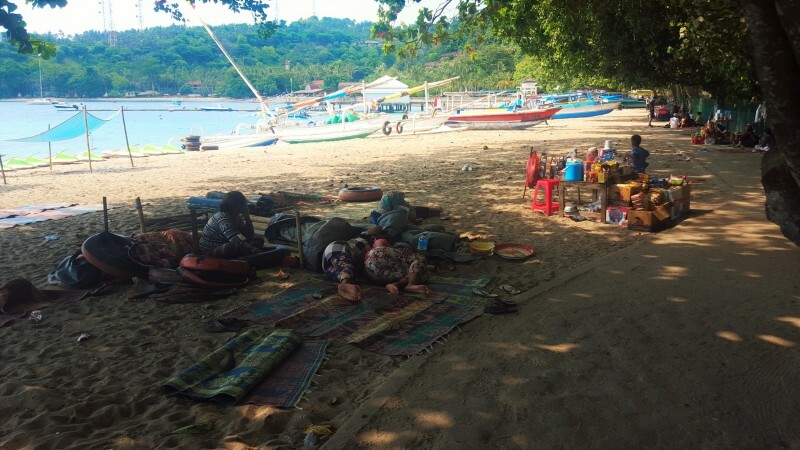 In fact, we’ve heard so much about the place (“It’s the next Bali!” from beach-goers and, “The traditional pottery and hand-loomed ikat is amazing!” from shoppers and “The hiking is out of this world!” from outdoor enthusiasts) that we weren’t sure what to expect when the reality of Lombok met with the visions of pristine beaches, volcanic hikes and indigenous art forms of lore. Guidebooks love to compare Lombok to Bali, which is understandable as the neighboring isles are close in geographical size (Lombok is about 1 million less in population, however, and it feels even more than that), and the most visited part of Lombok—the western side that faces Bali and the Gili islands—shares much of Balinese culture, including Hinduism, as is evidenced by the pretty temples that dot along the western shore. However, the majority population of Lombok, the Sasak people, are of animist decent and are now predominately of Islamic faith (but with an original twist, apparently, that incorporates aspects of animism). 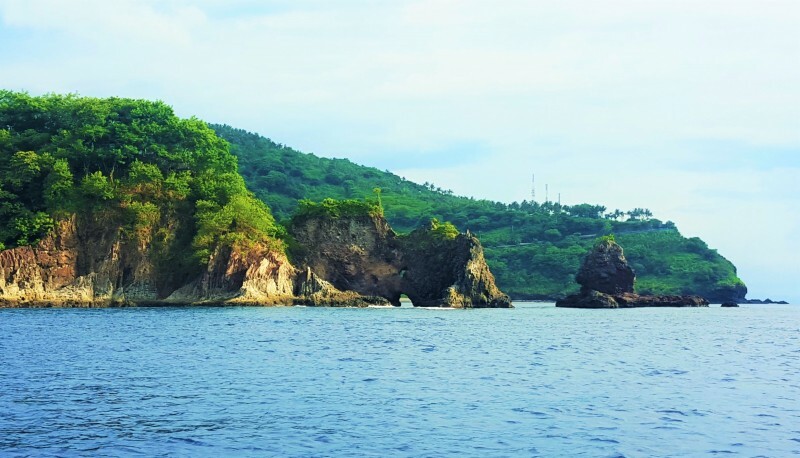 Another interesting difference between these sister islands is that they are separated by the Wallace Line that runs north to the gorgeous island of Sulawesi and beyond, making the fauna on Lombok different than the fauna on Bali. The landscape on Lombok is more arid here as well, thus affecting the natural landscape of the trees and plants, and making the island hop from east Bali to west Lombok an interesting change in scenery. See? There I go comparing them as well. … we mostly just hung out near our cozy B&B, read, swam, strolled along the beach, bought a few souvenirs in town and enjoyed the ocean breeze. That sounds so lazy, and like a wasted opportunity, right? 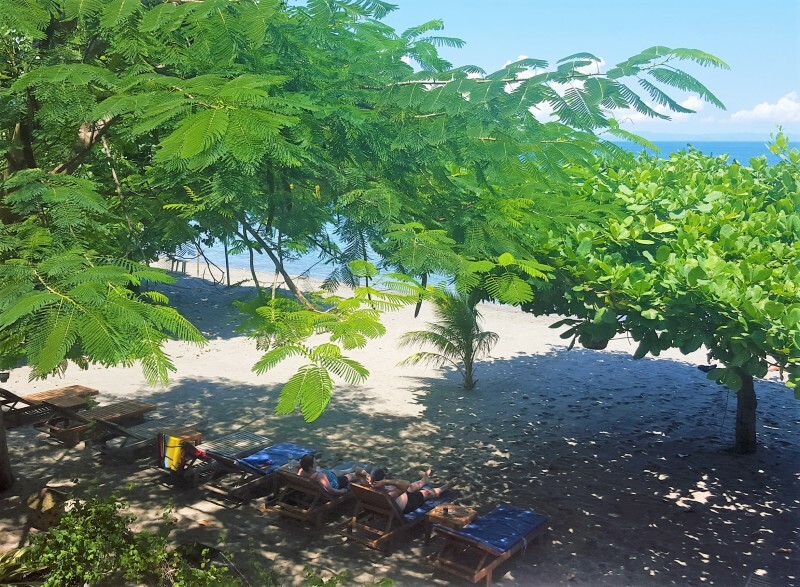 Normally, Sam and I feel compelled to cram in as much DIY exploring around a place as possible, but there was something so peaceful about Lombok that we felt it would be wasted if we didn’t just relax and enjoy lounging on our little veranda overlooking a private swath of Senggigi Beach. As for swimming, the sea is very clean, but the sand is volcanic in origin and thus dark-ish in color, so it makes it a little creepy for those of us who like to see exactly what is on the bottom of that ocean floor! For example, a string of seaweed brushing against one’s leg may or may not be an alarming experience … depending upon how much water-clarity means to you. Personally, I’d say clarity means a lot. But on to the joys of Lombok. During the day, there are all sorts of activities that the less lazy can indulge in — hikes, bicycle tours, shopping (there are tons of tour operators along the roadsides if your hotel doesn’t have its own itineraries), and of course surfing — and like Bali, lots of opportunity for massages and other pampering should you feel the need. At sundown, beach side restaurants set out bean bags (why are these things so popular? 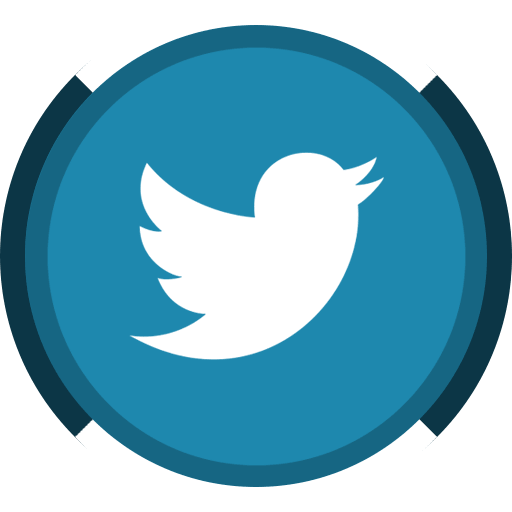 ), prop up their Happy Hour menus and fill the air with Coldplay. After dark, there is not much to do unless you enjoy hitting the handful of clubs in town, but for us, the quiet evenings were a highlight of our two-day, three-night experience. We’d sit out and watch the stars burn holes in the inky sky, using Sam’s i-Pad stargazing app to find constellations. By the end of our two days there, we both agreed that there is a lot to be said about not filling your weekend getaways with activities. But it wasn’t all lounging and star gazing. 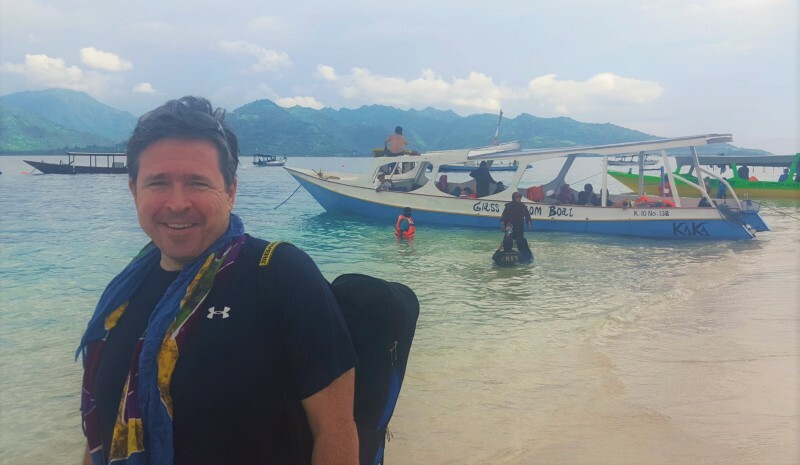 We did take a short trip to Gili Air for some snorkeling one afternoon, and that experience left me feeling I should at least do a post on our trip, if for no other reason than to help others planning their Lombok and Gili adventure. Now, this might be a little boring, but for those of you like myself who don’t or didn’t get the whole Gili-phenomena, allow me to explain. Basically, the Gilis (“Gili” actually means “Island,” so when you say “The Gili Islands” you are really just being redundant!) are a group of tiny islands clustered in the Bali Sea, just off Lombok’s north-western side, and they’ve gained a reputation over the last decade of being Indonesia’s answer to what beachy backpackers used to go to Thailand for: white-sand beaches, turquoise waters, sunshine, certain beverages that increase one’s sense of invincibility and a healthy dose of bikini-clad parties. Also, there is supposed to be some pretty good diving and snorkeling. The three main Gili islands are Gili Trawangan (the largest and I believe the most touristy), Gili Meno and Gili Air. We chose to visit Gili Air (pronounced more or less “Gee-lee Eye-air”), mostly because it is the closest to Lombok. 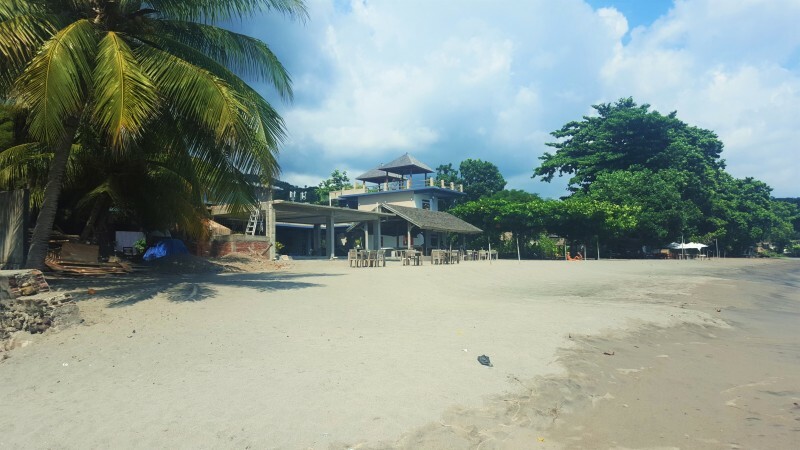 Also, we were intrigued with its reputation for being more of a laid back, less-developed, backpacker destination, which, turns out, is rather misleading as the eastern shores of that isle were back to back with various beach bars and cafes. “Undiscovered,” it definitely is not! We decided to go to Gili Air mostly just to say we did, and to get a bit of snorkeling in, but we didn’t want to wake up early to catch the public ferry, so we decided to find our own boat to Gili Air. 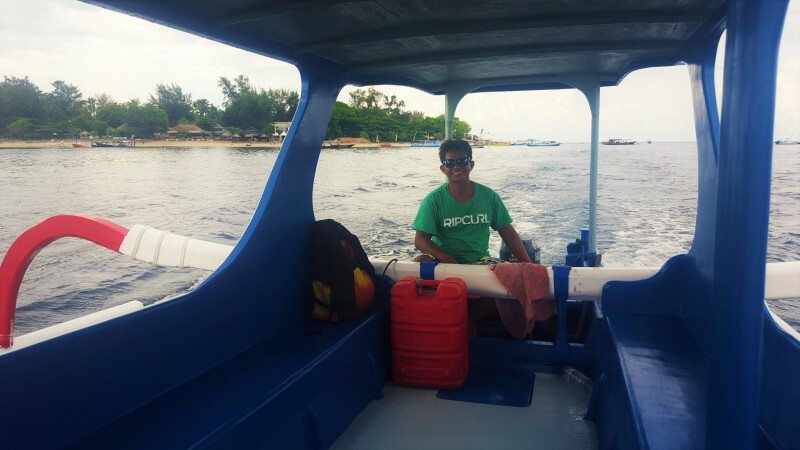 According to various blogs and guide books, finding a fishing boat to take you from any point in Senggigi to Gili Air should be straightforward and inexpensive, but we found it to be surprisingly difficult. We were finally able to convince a guy who worked at the ferry pier near the Senggigi Art Market to take us round trip for 500,000 Rupiah, I believe. We split the cost with another couple who joined us along the way, but still, this price was a lot more than what other bloggers claimed they could get, but I suppose it was still a pretty fair price. The main point of eggress for Lombok ferries and boats to the Gilis is the Senggigi area, but the exact point of departure is a bit confusing. There are actually two main piers in the Senggigi area, one being the pier near the art market downtown and the Kila Senggigi Beach Resort (the one we used–it is marked on the map below) and the other being further north (also marked on the map below), which is significantly closer to the Gili shores. I bring this up largely to avoid confusion as, if you do not carefully specify which pier you intend, you could find yourself in the wrong place. 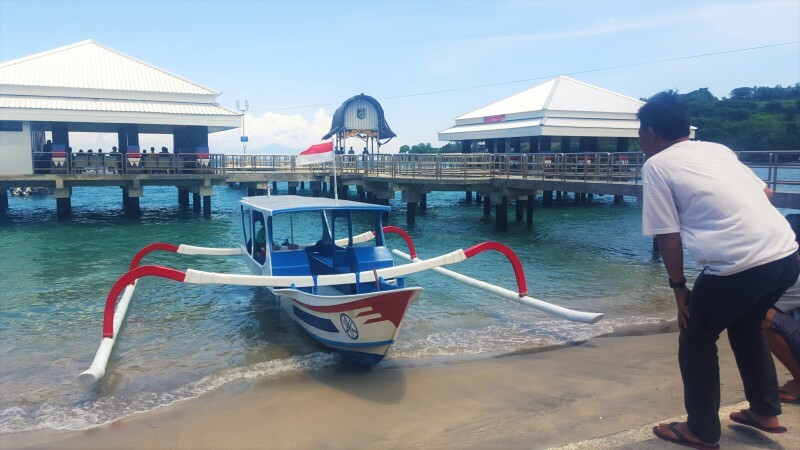 In any case, both piers have boats and ferries shuttling folks to the Gilis and back, but I believe the pier downtown near the art market offers more flexibility as it has private boats and a few ferries leaving throughout the day. Your best bet is to check the day before on the times, or simply get to the public pier further north by nine or so in the morning, as I believe only one departure via public ferry happens there per diem. It took about an hour and half to reach Gili Air! I think the public pier further north is only 30 minutes or so away, so that is definitely something to consider. On the bright side, the ride there and back was quite beautiful. When we finally got to Gili Air, it was already around 2:30 or so in the afternoon, and then proceeded to rain buckets! We hung out with our new travel friends at one of the dozen thatched-hut cafes along the beach, and when the sun finally made it’s afternoon debut, we grabbed our snorkel gear and slipped into the water. Now, I don’t know if we were on the wrong side of the island or what (we were on the eastern side), but neither of us were impressed with the snorkeling at Gili Air. 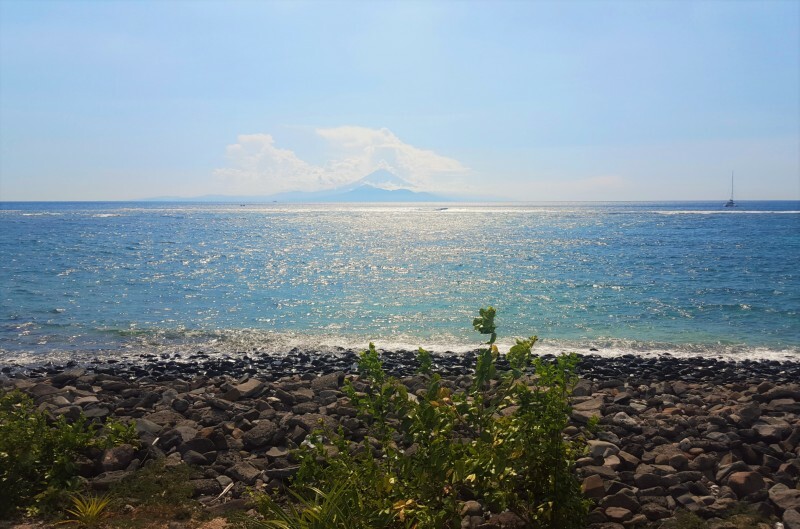 The water was certainly nice and clear and warm, but the coral was rather sparse—as were the fish—and we found it nothing compared to the snorkeling at, say Bunaken Island near Manado. I think we did a few GoPro clips while snorkeling, so if I ever get around to sorting through that, I’ll post something here. We headed back around 4:45, so all in all, we were really only at Gili Air for a little over two hours! Oh well. At least we can say we did it! Lombok is known for its pottery (enormous earth-tone vases decorated with natural woven fibers and old coins), ikat (indiginous patterned, hand-loomed cloth), wooden trinkets, salt water pearls that are purportedly ridiculously cheap, and mother-of-pearl decor. 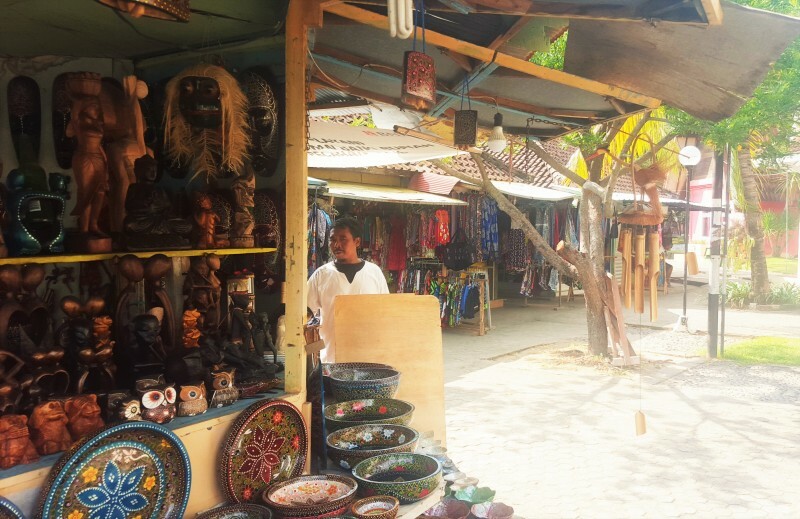 For pottery and ikat, you’re probably best off going on a tour or renting your own vehicle as several villages in inland Lombok are known for these crafts. I’ve a neighbor who took a shopping trip to Lombok just to buy the pottery–once I saw it, I understood why; the stuff is impressive–and she said that you can purchase a small container-load and have it delivered as there is no way you can fit these four to six-feet vases in your luggage … unless you’re Mary Poppins. We didn’t do any shopping of that caliber so I can’t offer more advice on the matter, but I noticed our B&B had information on where to go, so it shouldn’t be a problem to arrange. For trinkets, cheap clothes, mother of pearl items and salt water pearls, you’ll find these all around the Senggigi area. The art market (shown below and indicated on the map) is a small market near the Kila Senggigi Beach Resort, but for those who don’t enjoy haggling, you might prefer starting at the Bayan shop on the main street nearby. The selection at Bayan is quite vast for wood and mother of pearl items, and the prices are reasonable and placed on each item. The first decision to make, of course, is what part of Lombok you wish to stay in. I’ve heard that the south has some breathtaking beaches and amazing surf spots, but there really isn’t much else there. 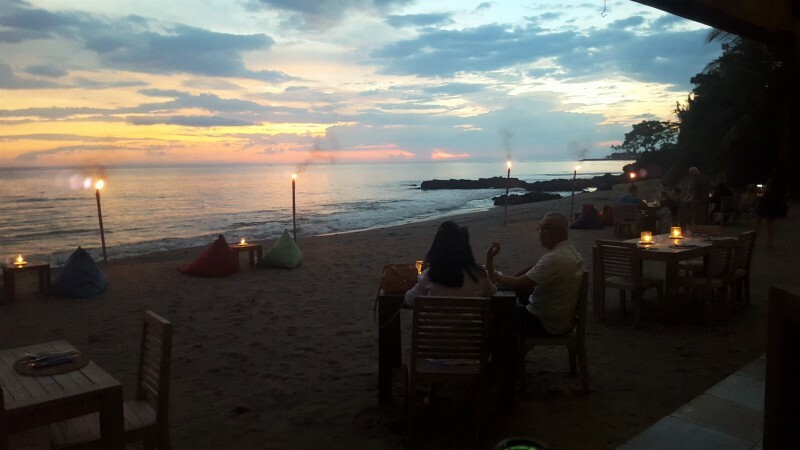 So if you’re coming to Lombok and want some dining options and perhaps hope to fit in a trip to the Gilis, then Senggigi would be your destination of choice. 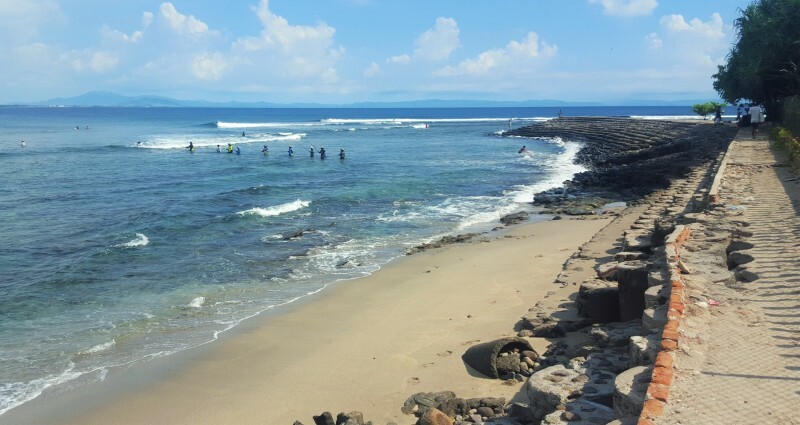 Senggigi is just north of Mataram, which is Lombok’s capital. After a lot of Trip Advisor and internet searches, I came to the conclusion that the Sheraton seems the default choice for many travelers staying in Senggigi. Sam and I wanted something a little less big and busy, so we went with Alberto’s B&B, which is located on the same grounds as Cafe Alberto, right on a private beach in Senggigi. The owner, Giuseppe, is a convivial Italian fellow who keeps this place in ship-shape. Plus, his cafe makes its own bread, pasta and pizza dough (the pizzas are quite good) so for those who’ve lived in Indonesia for a while and hanker for something hailing from the Continent, you’ll really appreciate Albertos. As for the rooms, when we went in late March of 2016, there were only four units, but it looked like there were one or two more in the process of being built. All units have a little porch or veranda (the view from our veranda is the fourth photo in this post), and the property surrounds a pretty pool with lots of tastefully placed lounge chairs. Our room was on the second (top) floor and we had a lovely wrap-around balcony that we really made use of. The room itself was quite large with a big bed that I guess must have been King size, but it seemed bigger. And the breakfast (included in the price) was huge and fresh. I’d say the only negatives about the place were the lighting in the room and the AC. I’ll explain. The room itself, though nice, is painted in a dark, blue-greyish color that really darkens things. This, coupled with rather sparse lighting, made the room feel a bit like a cave, but on the plus side, we certainly slept well. And we spent most of our time on the veranda anyway, so it wasn’t that big of a deal. As for the AC, it is quite weak, and if you are coming in like we did after a crowded, hot flight, you may be a little put off by it. However, once you keep the AC on for a while, the room does cool down enough to be comfortable. As for the positives, they totally outweighed these two little issues. We’d return to Alberto’s in a heartbeat if we could! By Air: Most people fly from the Denpasar, Bali airport to the new international Lombok airport (indicated on the map below), but since we were coming from Kalimantan, we first flew to Surabaya in Java and then from Surabaya, we caught a direct flight to Lombok. 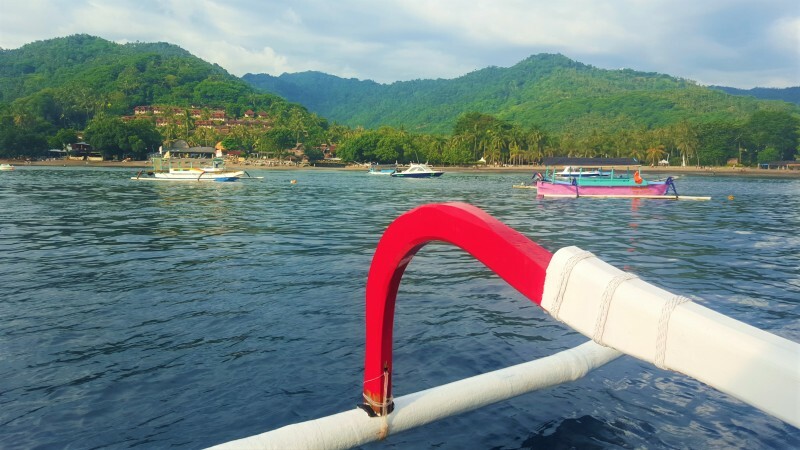 By Sea: Several companies offer various boat services from the east side of Bali to Lombok. We didn’t take this option, but I believe you can even buy a ticket ahead of time online and have everything pre-arranged. From what I understand, however, the price difference between flying and taking a boat is pretty negligable, so most people opt to fly if they’re headed to Lombok. 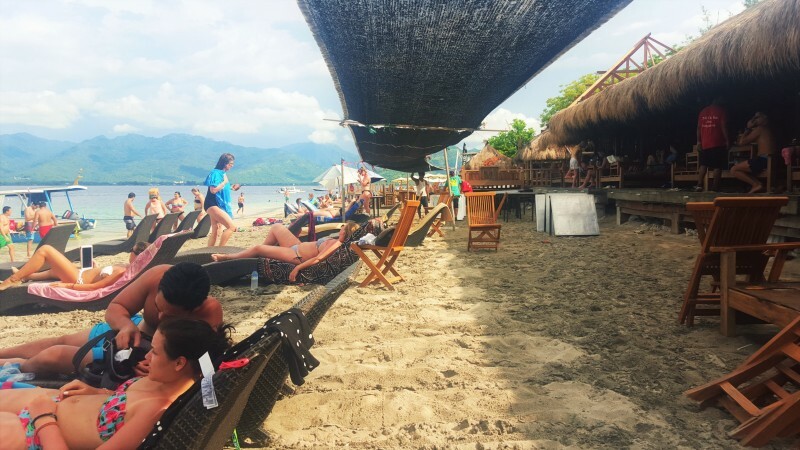 If you’re headed to the Gilis, then purchasing a boat ticket for a Bali-to-Gili or Lombok-to-Gili leg is much more common. 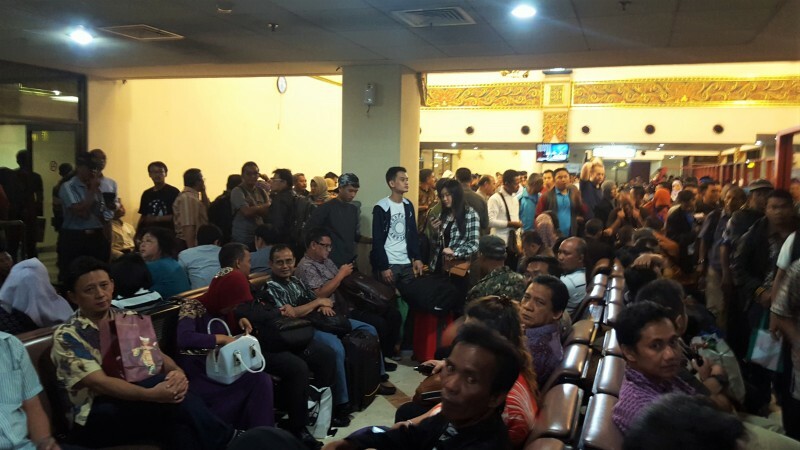 Once at the airport, several taxi stands are located directly outside (before the parking lot) where you can purchase a ticket for your taxi, the pre-determined price being around 200,000 Rupiah for a trip to Senggigi. You can try to bargain here and you might have some mild success, but if you’re on a tight budget and have the time, you’ll probably have better luck leaving the airport and hailing a taxi on your own, as the airport booths take a cut of the price. 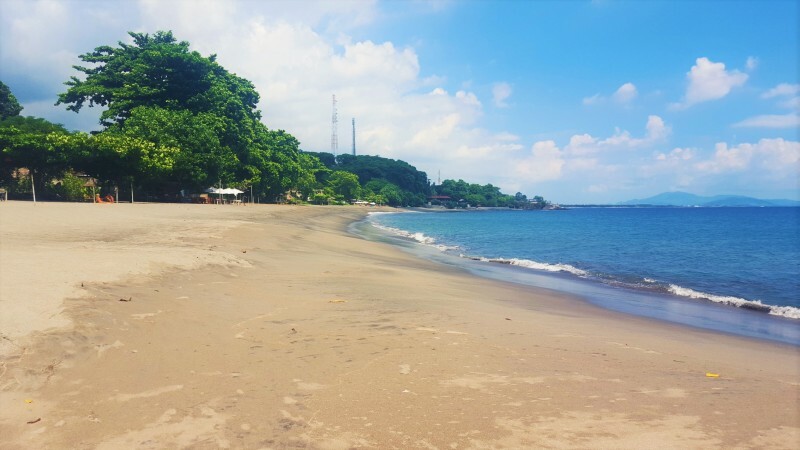 How far away is Lombok Airport from Senggigi? It took us about an hour and twenty minutes from the airport to our B&B in Senggigi, and that was at night with low to moderate traffic. Our return only took us about an hour, but I’ve heard it can take up to two hours, depending upon your driver and, of course, the traffic. 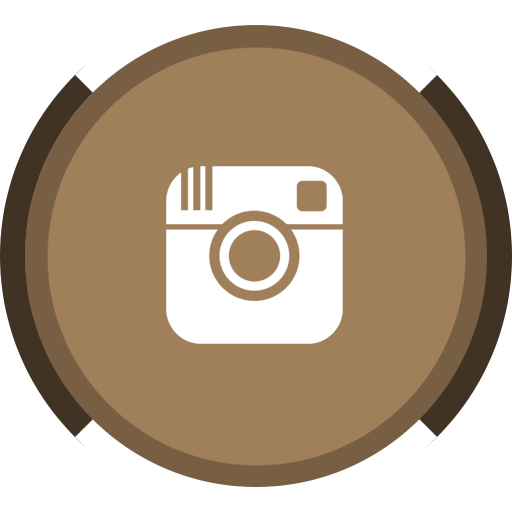 A final note: A friend of mine hiked the Rinjani Volcano last year with her partner and took some pictures. I hope to get an interview of her experience and if so, I’ll post that later on with a link here, as I’m sure her story is amazing!